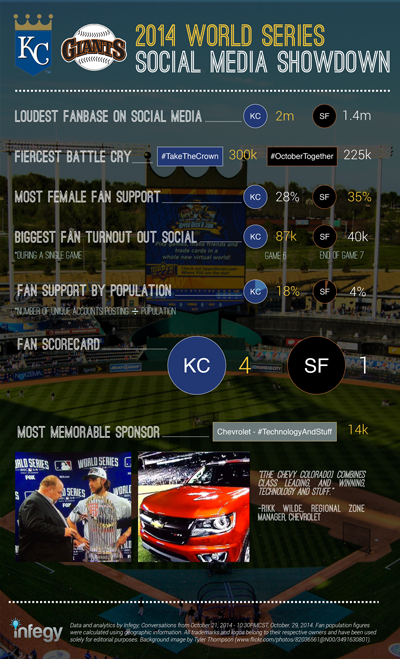 The Royals were the clear winner of social media support with just over 2 million team mentions and related hashtags. The Giants generated around 1.4 team mentions and related hashtags. 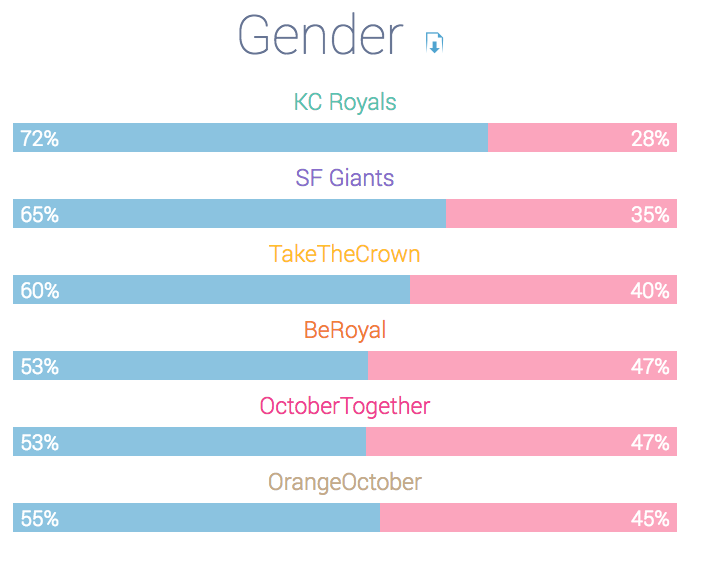 The Royals were the clear winner of social media support with just over 2 million team mentions and related hashtags. As might be expected, mentions of each team spiked significantly every time that team won. This generally carries over behavior we recognized during the presidential elections where supporters of the winners more often take to social media, while supporters of the losers taper off in social media support after a loss. The Royals also saw greater support per percentage of the population than the Giants. At peak conversation volume for the Royals, which occurred on October 28th, there were an estimated 87k fans talking on social media using #TakeTheCrown. 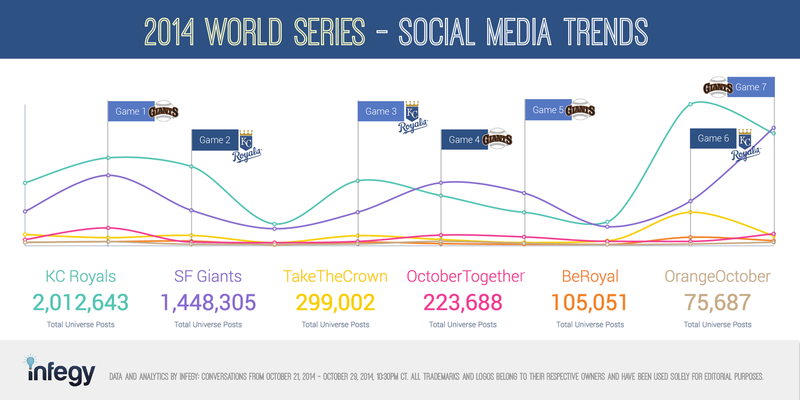 At peak conversation volume for the Royals … there were an estimated 87k fans talking on social media using #TakeTheCrown. At peak conversation volume for the Giants, which occurred on October 29th, there were an estimated 40k fans talking on social media directly mentioning the team. That’s 18% of the population for Kansas City, and 4% for San Francisco. 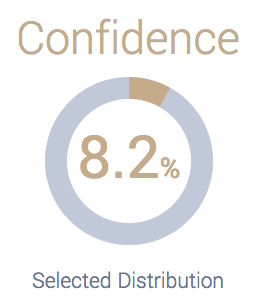 Confidence in the Royals was at an all time high on October 28th with 8.2% of all conversations expressing their faith in the team. At the same time confidence in the Giants on October 28th failed to take a downturn, appearing at a constant 5% from game 5 through game 6. From this it appeared that fans were still very confident the Giants would come out victorious. However, throughout the game confidence in the Royals quickly declined to 3%, while confidence in the Giants jumped slightly from 5% to 6% of all mentions. We’ve been seeing more and more fan support from women on social media in the past few years. During the World Series there were definitely more female Giants fans cheering on their team than there were female Royals fans doing the same. The most used hashtag was #TakeTheCrown with a total of 300k; the highest surge was to 100k on October 28th and resulted from the huge win in Game 6 for the Royals. The second most used was #OctoberTogether with a total of 225k, the highest surge was to 53k on October 21 and resulted from the Game 1 triumph of the Giants over the Royals. October 21st, the World Series begins & Lorde’s hit song ‘Royals’ surface because San Francisco’s radio stations ban single prior to the World Series. October 22nd, Royals score their first run in a World Series game in 30 years & fans want to kick FOX commentators to the curb, especially Joe Buck. 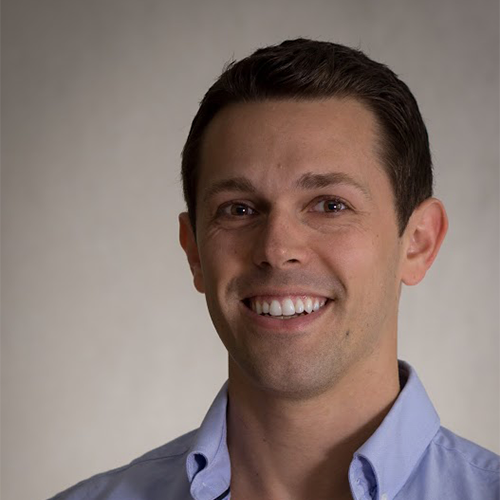 October 27th, Madison Bumgarner shuts down the Kansas City Royals & news of rising MLB star, Oscar Taveras, tragically dies in a car accident comes to light on social. October 28th, Royals force game 7 in World Series & a moment of silence was shared before game 6 to honor Cardinals outfielder Oscar Taveras’ recent passing. October 29th, Giants take the crown & conversations of Joe Maddon becoming Cubs manager, overshadows game 7 of the World Series & fans are not amused (33% positivity).